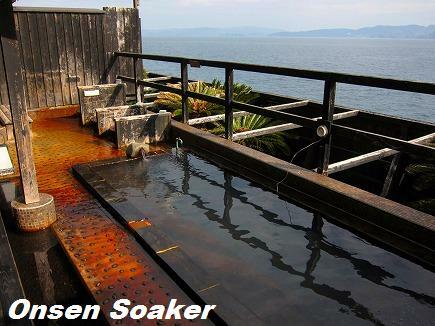 onsen soaker: Yasuragi Ioujima, Nagasaki City, Nagasaki Pref. The smaller open-air bath. The floor stained chestnut brown with onsen ingredient. If you come to Nagasaki, Kyushu Island, I recommend you to spare at least three hours to visit Yasuragi Ioujima(やすらぎ伊王島), Nagasaki Onsen in Ioujima(伊王島) off the coast of central Nagasaki City. You can enjoy an onsen soaking and short cruises. Ioujima is a small island with 2.26km² area and nearly 900 people, once prospered after a coal mine opened in 1941. The coal mine closed in 1972 and resort development started in '80s. Yasuragi Ioujima is a big complex now accommodating maximum 420 guests per day. The smaller Indoor bath. There are a sauna, too. Its onsen was developed rather recently, and I didn't expect anything write home about, but the sodium hot springs were fresh and good, small bubbles sparkle on the surface of the water like soda water. Of course you can soak yourself watching the sea at the open-air bath. Two bath rooms are bit different, the left bath room is bigger. Mens' and ladies bath rooms change daily. The main building of Yasuragi Ioujima is believed to be Mediterranean style. Just 20 minutes ferry ride from central Nagasaki City will takes you to the Ioujima, then it take only a few minutes walk to reach Yasuragi Ioujima. If you make a day visit, it costs only ¥980 including round trip ferry tickets, and onsen admission fee including a hand towel and a bath towel. You don't have to bring any bath goods. There is a counter of Yasuragi Ioujima at the Ohato Pier (大波止埠頭) of Nagasaki Port (長崎港). Buy your ticket there. They will hand you one way ferry ticket and onsen admission ticket. Keep these and hand the ferry ticket when you get off the ferry. After arriving Ioujima, walk right along the sea or you can expect free shuttle service. You'll get return ferry ticket at the entrance of the onsen at Yasuragi Ioujima. A bridge connecting Iojima and main land Kyushu is under construction. [update] Now that the bridge has opened in March, 2011, you can visit Ioujima by bus. It serves only on weekdays. Check out the timetable and other info at tourist information center. There are three pot baths for single use at the each open-air bath. Equipment:Complimentary soaps, shampoos, hair driers, skin lotions and others. There are a restaurant inside Yasuragi Ioujima. The ferry "Cobalt Queen the second" arrived at the Ioujima. Access: Take a ferry from Ohato Pier（大波止埠頭） of the Nagasaki Port（長崎港）. It's within walking distance from Nagasaki Station (about 15 minutes). Note: You have to buy day visit tickets at the counter of Yasuragi Ioujima at the pier, because normal ferry ticket is ¥650 one way and day visit plan is special discount offer. If you don't enter the onsen at the Yasuragi Ioujima, you will be charged the balance of regular fare. The Megami Ohashi or the Venus Wing and central Nagasaki City view from the ferry. Yes, it's a headache for me. I have to give up taking pictures at many onsens recently. According to some news reports, some ladies film changing rooms secretly to sell DVD and more and more onsen prohibit to take pictures inside. I ask manegers of onsen or other soakers to permit taking pictures and when they say OK, I take pictures. And if nobody's there, I don't have to hesitate. This happens at small public bath at remote places. Thanks for providing a great description of this place. I visited Yasuragi Ioujima a few weeks ago and managed to make my way out there largely based on your instructions. Really enjoyed the three pot style baths with increasingly hot water and I will definitely return. Thanks for visiting Japan and my blog. Did you visit there by a ferry or a bus? I heard now it's easier to visit by bus as a connecting bridge had completed. Excuse me for taking several days for response. I was spending short holiday in Nara Pref. I forgot to ask you if it's common for other onsens to have pot-style baths with different water temperatures? I hadn't seen that setup before, and found it to be really great since I tend to prefer the water being warmer than the average onsen temperature. Well, it's uncommon or more precisely, this is rare case, I guess. If there are some pot tubs, all of them are usually same temperature. I'm surprised to know you like hotter bath. Almost all visitors to Japan I talked - regardless from where they were said that onsen in Japan was tooooooo hot for them. Thank you for providing the review of the onsen. I visited there today and it was a great experience. I wasn't sure how to purchase the ferry + onsen ticket, but it wasn't much more anyway. For the ferry you want cubicle 11 and at the time the ferry departed from pier 4. There are no English translations for this at the terminal but people were helpful in translating for me. The tubs outside were particularly good. thanks you for this great post! It inspired me to try it out myself and i would like to share some information with you. The fairy programm was just a limited time offer. As you mentioned, the finished the bridge already and so you cannot find the cheap onsen fairy double ticket anymore. However they opened up a small bus trip, where you can do a round trip to the onsen and back for around ¥800. Still including the towels.